The body of a 15-year-old girl who had been missing all weekend was found near a business in Compton, ending her family's heartbreaking search Monday. "They found her and I don’t know what to say. I don’t have words," said Blanca Bautista, the girl's mother. 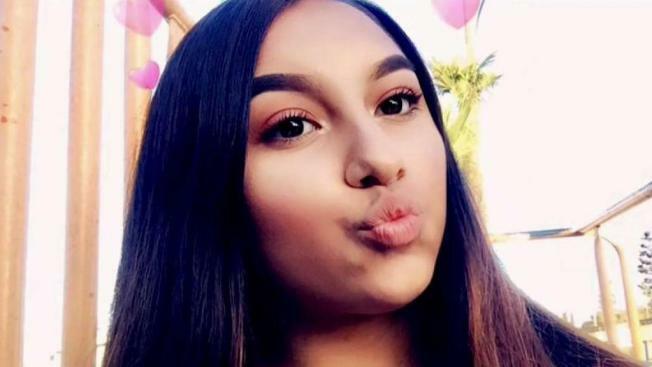 The mother of Samantha Bustos, 15, confirmed to the Los Angeles County Sheriff's Department that the person they found was indeed her daughter after detectives showed her a picture of the victim. The teen was last seen Friday in Compton. Her mother said her daughter and the girl's best friend had told their parents they were having a sleepover. They had gone to a party, Bautista said. Samantha said she would be home Saturday, but she didn't come home. Samantha's body was found face down in the bushes Monday morning at 1:30 a.m. in the 400 block of Victoria Street near National Retail Systems, the Los Angeles County Sheriff's Department said. "This individual did sustain traumatic injuries to upper torso and is being investigated as homicide," Lt. Rodney Moore said. The company was working to provide surveillance footage. On Tuesday, mourners stopped at a memorial in Compton for Samantha. "It just hit me emotionally before I knew who she was," said Leticia Willis, who works nearby. "When I found out, I just broke down." Authorities had not identified a suspect, but detectives told Samantha’s mother she was last seen in a white Jeep with two young men. "They just hurt her, that’s what he said. They hurt her bad," Bautista said. Anyone with information is asked to call the sheriff's department at (323) 890-5500. The family of the victim has set up a GoFundMe to help with expenses. If you would like to donate, you may do so here, but please note that GoFundMe takes a percentage of money raise in the form of platform and other fees. Heather Navarro contributed to this article.